Our Inject-A-Seal method is a proprietary solution designed and developed through our over 40 years of practice and experience in effectively and efficiently stopping poured-concrete foundation wall crack leaks. This method, which incorporates the finest selection of materials and the technical experience of carefully and delicately preparing the different elements together, allows for a reliable and sustainable cure in preventing water and other organic materials from seeping/entering through a poured-concrete foundation wall crack. 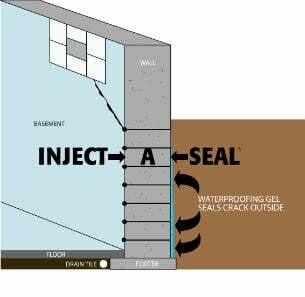 Inject-A-Seal is a UTECH Basement Waterproofing exclusive. The common materials of Epoxy and Urethane which are widely used in the industry by our competitors have the potential to prevent leakages, these materials are known as interior sealants that solve the problem almost immediately by blocking off the leakage. However, through years of returning to re-do and re-repair homeowner wall cracks done and completed by our competitors, we have come to realize that the tedious method of correctly applying these chemical materials on the interior crack if not done accurately, does not completely block off the openings in a crack. This prevents the sealant to provide the needed blockage and eventually allows seeping and leakage through the molecular sized pores in the crack. The numerous number of call backs caused by incorrect methods of applying the chemical onto the problem area has constantly increased through the years, homeowners have come to realize that our Inject-A-Seal method which is composed of completely organic compounds, which has zero harm in terms of post-reactivity gasses, smells, etc. is the safest and most reliable and sustainable solution. The density, viscosity and molecular level effectiveness of our proprietary material has been constantly further evaluated and tweaked in the last 20 over years to ensure the best possible solution at the most cost effective price is available to homeowners around the Greater Buffalo region. We have continued to invest in researching and refining better compositions based on the latest technological advancements to serve our customers in the best possible manner. Besides the safeness and effectiveness towards problem solving, our Inject-A-Seal methodology allows for a fast and clean approach towards problem solving. The overall process is conducted in the interior side of the foundation wall which prevents altogether any serious and expensive exterior excavation work. The process is conducted within a 4 to 6 Ft. area of the crack by highly trained Inject-A-Seal technicians. The technicians are trained to focus on two of the most important aspects of the solution; functionality and cosmetics. The entire process is usually completed within a 3 hour window.